The FAVERSHAM set comprises a 2 & 3 seater. 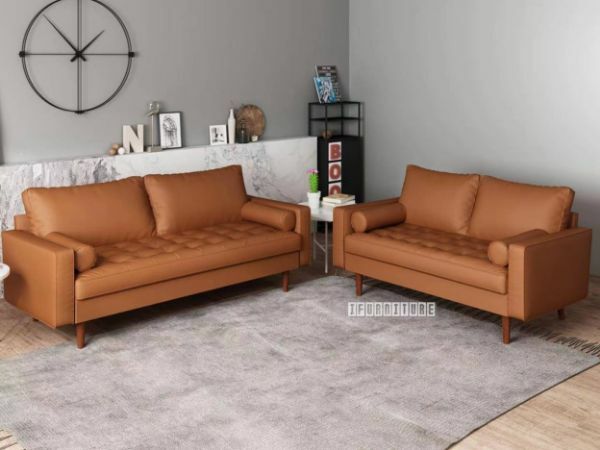 It is upholstered in an attractive, light brown, leather-look material. Each sofa has two smooth back cushions (held in place by velcro), two bolsters, and the seat cushions are a single piece, with soft and comfy button detailing. The COMFORT SLEEP is a Medium Firm, Pocket Spring mattress. SNOW WHITE is a cute natural colour bed in Federation Style. A perfect piece for your prince, princess or your own bedroom.